If you are under 25 you may not even recognize this! It is an old Boston pencil sharpener from the 60's. This is something that my wife bought years ago and I thought that it would make an interesting subject. 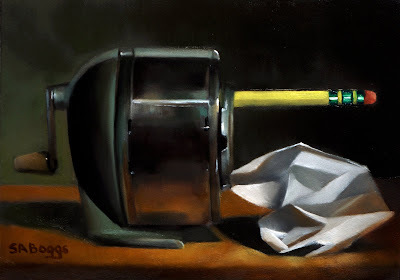 Mostly I was attracted to the shape of the sharpener and the old somewhat tarnished steel. I hope that you enjoy the painting!